One man has since been released from garda custody. FOUR PEOPLE HAVE been arrested by gardaí in Dublin after stun guns and €560,000 worth of drugs were seized in two separate operations. A vehicle was intercepted on the Mill Road, Blanchardstown at around 7.30pm yesterday evening as part of ongoing investigations by the Garda National Drugs and Organised Crime Bureau, supported by the Special Crime Taskforce. A quantity of cannabis herb was recovered and two men (aged 42 and 39) and a woman (46) were arrested. They are currently detained under drug trafficking legislation at Blanchardstown, Finglas and Lucan garda stations. Follow-up searches took place in the Blanchardstown area which resulted in the seizure of a further significant quantity of cannabis at a premises in Fortlawn Driver. The drugs recovered during this operations have an estimated street value in excess of €560,000. Meanwhile, a package has been seized by Revenue containing a consignment of stun guns which had been imported from the Netherlands. 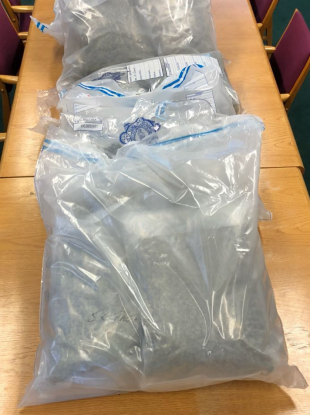 The seizure was made yesterday morning at a residential address at Alderwood, Tallaght following a joint intelligence-led operation by the Revenue’s Customs Service, the Garda National Drugs and Organised Crime Bureau, and the Special Crime Taskforce. A 24-year-old man was arrested and taken to Tallaght Garda Station where he was detained under the provisions of Section 30 of the Offences Against the State Act. He has since been released pending the submission of an investigation file to the DPP. Email “Four people arrested as stun guns and drugs worth €560k seized in two separate operations”. Feedback on “Four people arrested as stun guns and drugs worth €560k seized in two separate operations”.